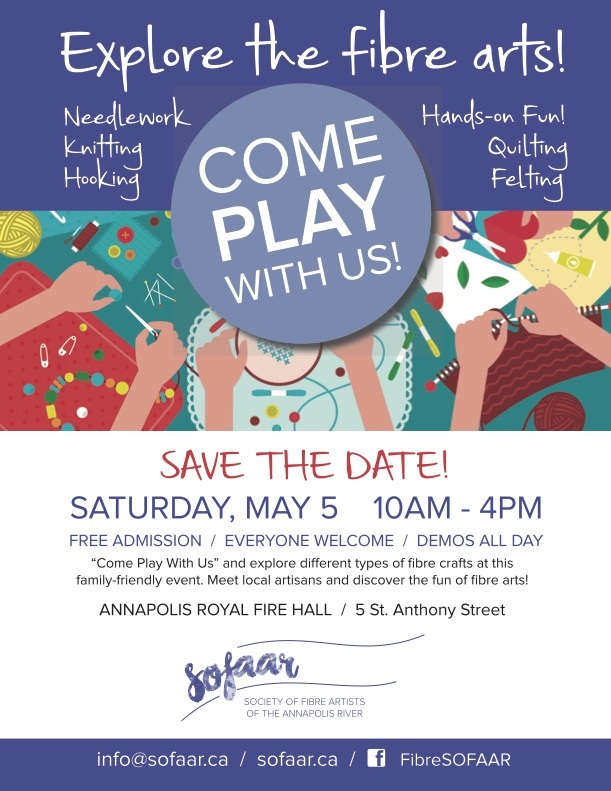 SOFAAR will be hosting its second annual Come Play with Us communal fibre-crafting event at the Annapolis Royal Firehall again this year. We would love to hear from you all about participating. 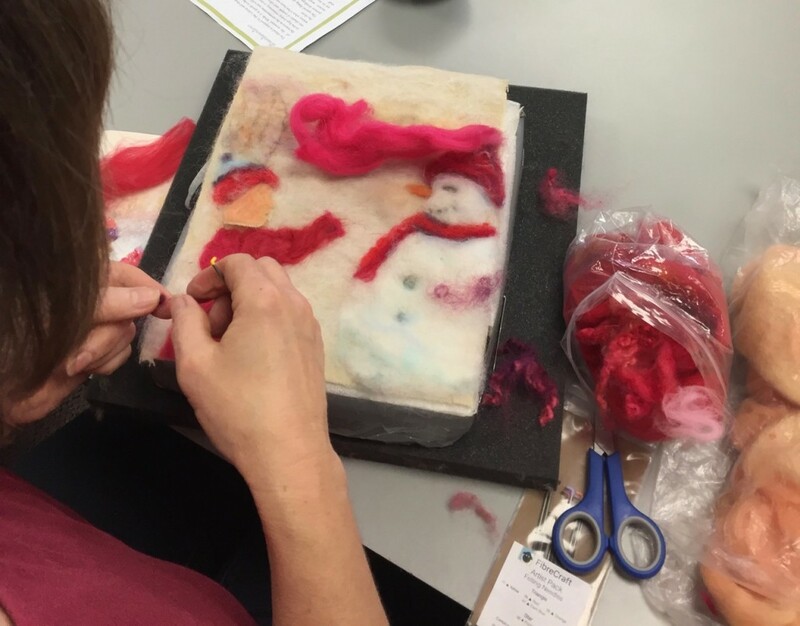 Last year, over 200 visitors came through the Firehall to see what working with fibre was all about. We had a such a great time and so did the kids and parents who came out to see. Many men and children learned how to sew on a button, do some hooking, try some wet-felting and pick up a needle! Come to craft for a couple of hours or all day. Come and do a demo for everyone to see. 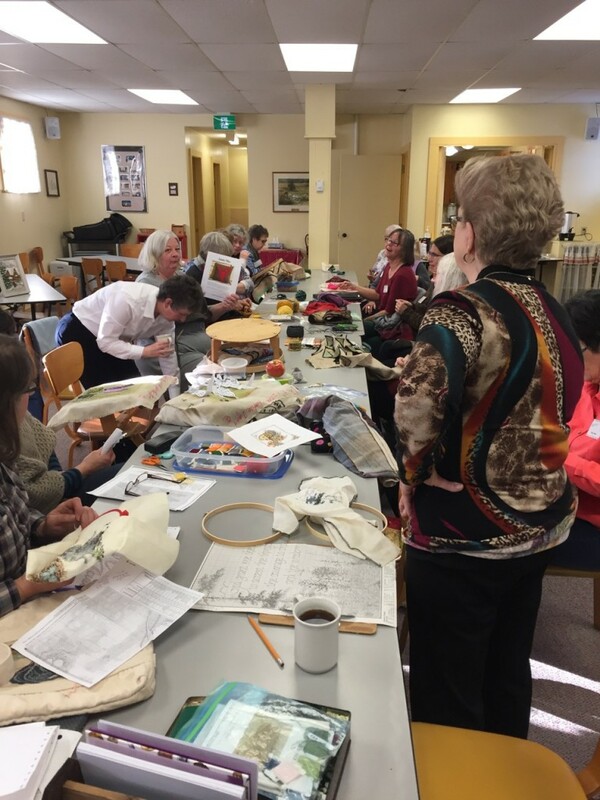 Yesterday, January 20th, 2018 brought together 22 fibre-happy crafters to begin our new year of fun fibre afternoons. We met at the Saint-Alphonsus church hall in Bridgetown. An enjoyable afternoon was spent working on projects and showing and telling what we were all up to. Lots of different techniques to see: knitting, felting, hooking, cross-stitch and embroidery. Keep checking in for more Saturday fibre filled afternoons dates. 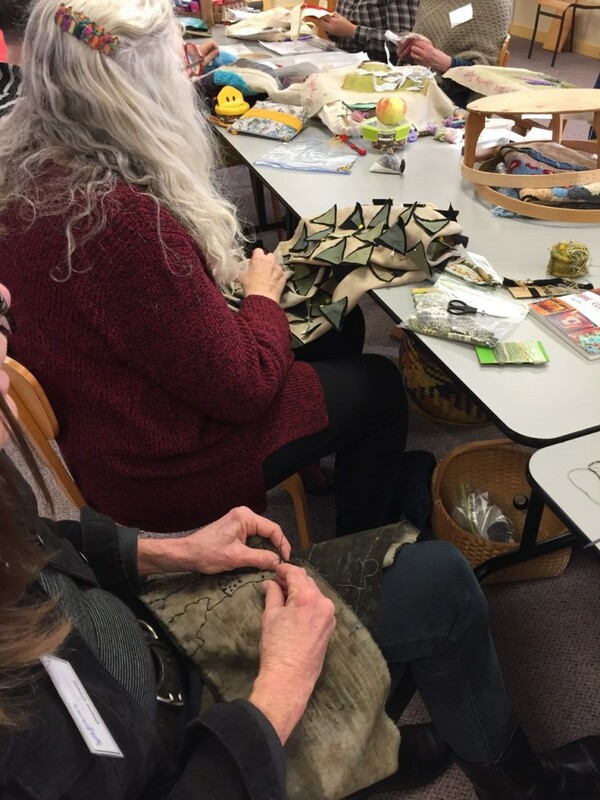 Cast away any winter blahs and come out for an afternoon of communal fibre crafting in Bridgetown on January 20th from 1:30 to 4 pm. 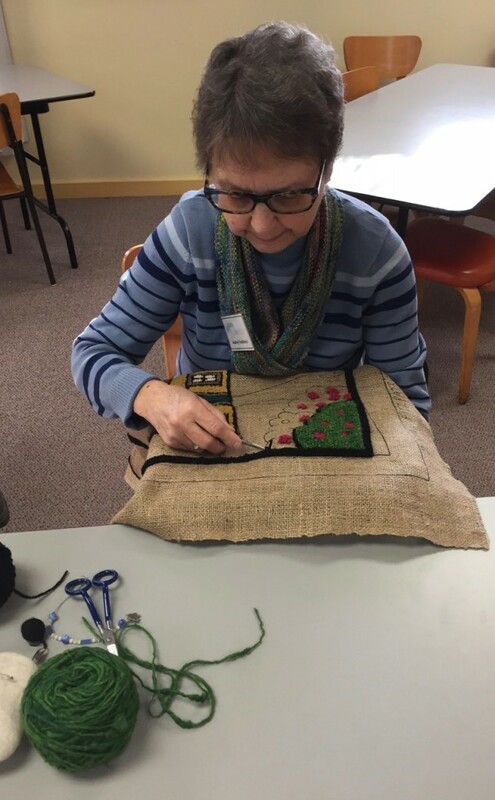 Bring the project you are working on whether you are knitting, hooking, quilting, sewing, cross-stitching or other and any show and tell you would like. If you are a member, bring a friend. If you are friend, come and see what SOFAAR is all about. All welcome. All fibre arts welcome. Where: Saint- Alphonus Church Hall, 93 South Street, Bridgetown. Across the Bridge on the right past the pub. Weather permitting. We will post if the event is cancelled. Happy fibre-filled year of 2018 to all of you! Some news to start the year. The Mary E. Black Gallery invites proposals from community groups, cultural groups, guilds, artists, craftspeople and curators for the year of 2020. Annually, seven shows are selected by the Exhibition Review Committee to fulfill the gallery’s mandate, as Nova Scotia’s only public fine craft gallery, to exhibit traditional and contemporary fine craft created by aspiring and established local, regional, Canadian and international artists. Juried, curated and travelling exhibitions are eligible. Year round the Nova Scotia Centre for Craft and Design hosts exhibitions in the Mary E. Black Gallery which educate the public about craft and design and promote the pursuit of excellence in the craft community. Please indicate if you are open to the possibility of being curated into a two person show, group show, or shared use of our gallery space. Proposals and support material must be submitted via Dropbox link toadministration@craft-design.ns.ca by 4pm AST on April 3, 2018. Late submissions, incomplete applications, or submissions sent outside dropbox will NOT be accepted. The Mary E Black Gallery staff offers assistance to applicants who may have difficulty with the process or face barriers to applying. If you would like help applying, please contact the gallery at administration@craft-design.ns.ca(link sends e-mail) or 902-492-2522.